Time has come to say goodbye Scotland ! And a lot of fun ! 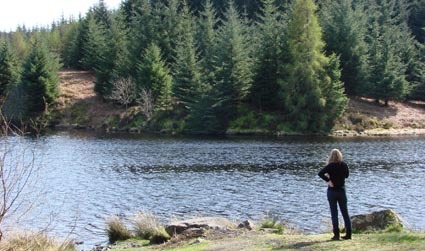 The advice a can give you is : GO and ENJOY SCOTLAND !!! 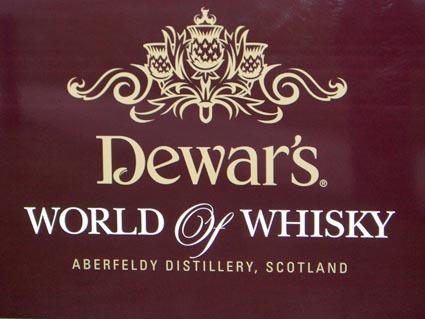 Welcome to Dewar’s world ! 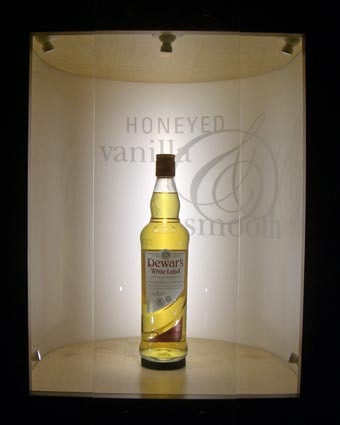 = This is the story of the founders of DEWAR’S. I’m one of the lucky people who have the opportunity to visit distilleries during courses at the University ! 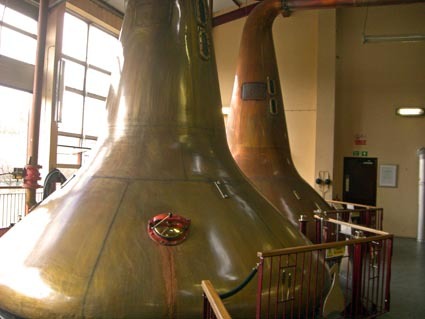 Indeed, during the semester, I went to the Highlands to visit Dewar’s world which included a guided tour of Aberfeldy Distillery. I didn’t understand everything because the guide spoke too fast and the vocable was very specific but I remind the main stages of the process, that’s enough for me ! Then, we tasted several whiskys from the distillery, but at 2.00 pm, it’s quite hard to drink two glasses of whisky without anything else ! If you want to learn more about it: ! 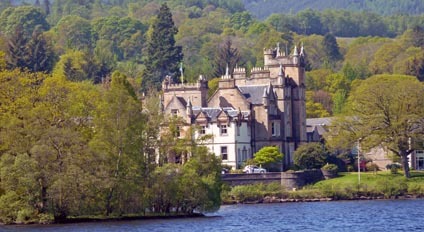 Scotlands is composed of two parts: the Lowlands and the Highlands. The second one is the biggest and it represents 85% of the country. 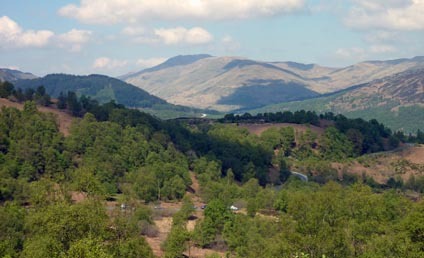 The Highlands correspond to the north of Scotland and is characterized by its sparse population. Indeed, it’s a natural region with beautiful landscapes and it’s the premier area in Britain for wildlife with many mountain ranges. 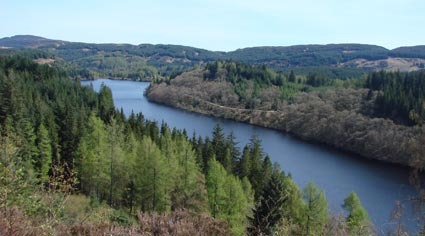 The most famous park is the Trossachs. This areas is distinct by its culture and its history. 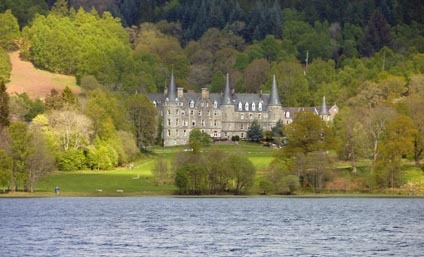 Gaelic is still used in the Highlands and people speak scottish as their main language. 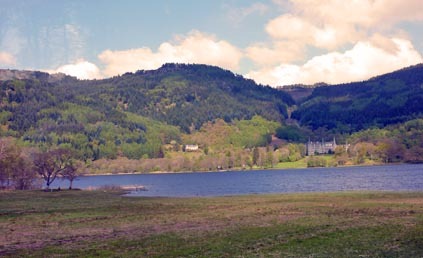 The Highlands are famous for their valleys and lochs. 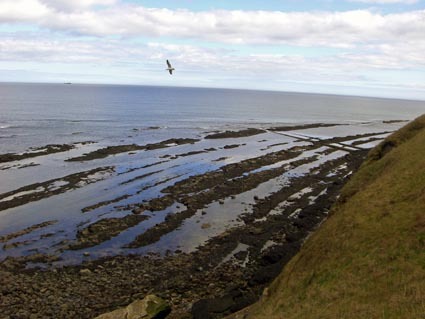 There are more than 200 in this area and some are the biggest of the UK. 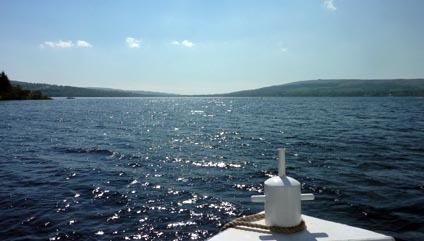 The most famous lochs are: the Loch Ness (the most famous lac of th world, with the legend of Nessy!) 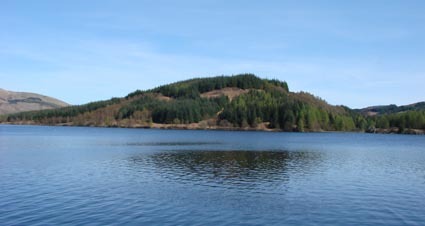 and the Loch Lamond (the biggest loch in the UK). I’ve been in the the Highlands several days, to enjoy this beautiful area. 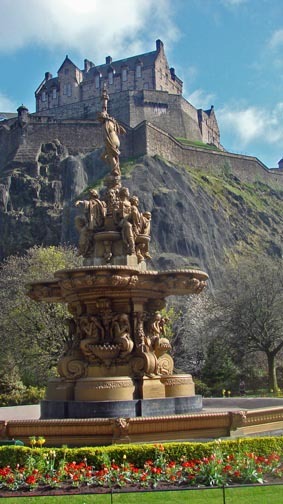 I’ve seen the two famous lochs, but many others too and several castles like Stirling castle, which represents the independence of Scotland with the battle of Stirling and William Wallace. 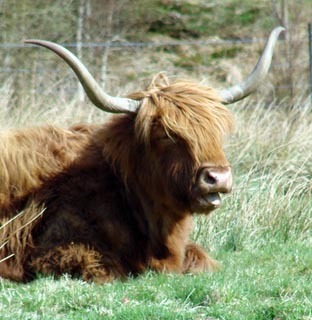 I’ve seen a lot of mountains and natural parks and the funny scottish cows ! After two months working at British Heart Foundation, I let me explain what was my job that will end next week. The shop were I work is a typical charity shop. It consists of two places: the shop floor and the sort room. The shop floor is the place where goods are displayed. You can find clothes, jewelry, shoes, bags, and other accessories. Both men and women are targeted. 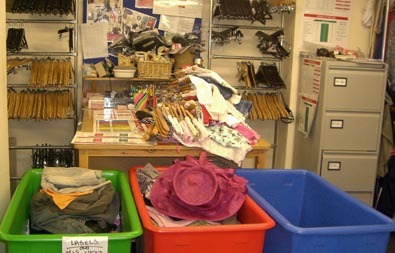 The sort room is the place where donations are stored and sorted. The manager, Rona, is responsible for everyone on the shop and she is very nice. She works 5 days a week. Mickael is the second manager, he is paid too and is responsible for us on Rona’s day off. The rest of the team is only volounteers. When I began my internship in March, we were less than 10. Today, were approximately 20. But we are never 20 working together. We are around 5/6 per day except Thursday where we are 10 or more. The shop is open on Saturday but few volounteers want to work on this day and I think that when it will be open on Sunday, it will be hard to find people ! Indeed, the manager told me that they plan to work 7 days a week. I have already explained how I found this internship, but let me explain the first days. The manager asked me what interested me to do. I wanted to do something where I could speak english and to be in contact with scottish customers. The explained me that she needed someone on the till because many volounteers didn’t want to do it. I agreed to do it mostly, but to do other things. The first day of my internship, after a quick training at the till, I began alone to work with public.. What a stressful situation ! I didn’t untestand every scottish customer, the currency wasn’t familiar to me and I didn’t know every item we sell on the shop! Added to that, the first day I worked we were only the manager and me. She was also very busy and I had to be responsible and independant. At the end of the day, my fear was to have made mistakes on the till but the total was exact to the penny ! What a good new. The manager trusted me very quickly and it was very pleasant to work with this team. I was sometime responsible of every volounteers when Rona and Mickael weren’t available. Every volounteer was very nice with me, and the atmosphere was very good. The shop floor is where I spent most of the time. Indeed, I was the official cashier. My work in the shop floor consisted of using the till and selling goods. I never had problems with the local currency but the most hard thing was to understand what scottish people said and asked. Selling wasn’t the only thing to do, I also had to take delivery of donations and to recruit new gift aid donor, what means that for every 1£ people give, the BHF can claim an extra 25p from her Majesty’s Revenue and Customs with the government adding an extra 3p. People just had to complete the gift aid declaration form but most of them didn’t want. Today, the gift aid sales conversion is around 30% in the shop I work. The manager finally asked me to take care of the window: choosing dresses, shoes, jewellery… It was quite fun to do it ! 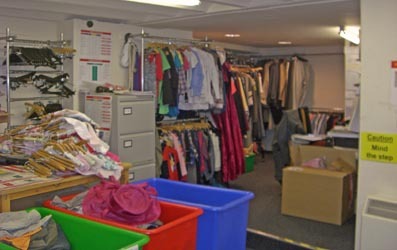 The sort room is the place where all donations and new goods are stored. Then, they are sorted and priced. There are several rooms for all items: clothes, shoes, bags, bric a brac,, books, jewellery… I spent some time working on this place in all of the tasks. If someone need to find an internship in Scotland, I think the best solution is to work as volounteer in a charity shop, particularly at British Heart Foundation in Portobello. Ladies and gentlemen, today is an historic day for the UK. 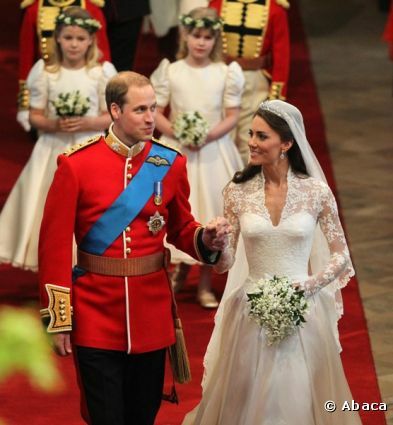 Today was the wedding of Prince William and Kate Middleton who have been made Duke and Duchess of Cambridge. The wedding has been watched by millions of people around the world and it was a day off in the UK. For my part, I worked on the charity shop but I have seen the beginning of the wedding of the TV. When I came to the charity shop, it was so quiet ! There was no customer because everydody was watching the wedding. Since few weeks, whatever the store, fast every shops in Scotland were decorated for the wedding with flags, pictures, tableware, books and DVDs about the the newlyweds. The most amazing was the food: even on cupcakes was the couple present ! The royal wedding is unique because of its cost. The day off will cost approximately 6 billion pounds and although the two families will pay for the wedding costs, security costs will be paid by the UK and the taxpayers. Fortunately, some sectors will benefit from increased consumption during the marriage: the tourism and catering. Indeed, there were more than 1 million tourists in London streets today and professionals don’t hesitate to increase there prices. The wedding will be a huge opportunity for Kate’s parents like every « souvenirs shops ». 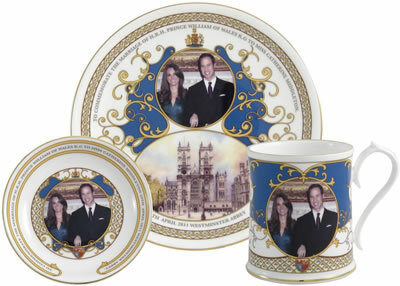 Their company will launch a new range of crockery and glasses for picnics on the theme of royalty. Politics, economics & crisis ! It is time for elections in Scotland. Indeed, the new parliament will be elected on 5 May at Holyrood (10 min walks from my flat). I will not talk about this, but about a famous political subject: the economic crisis. This crisis has affected the UK as any other country. 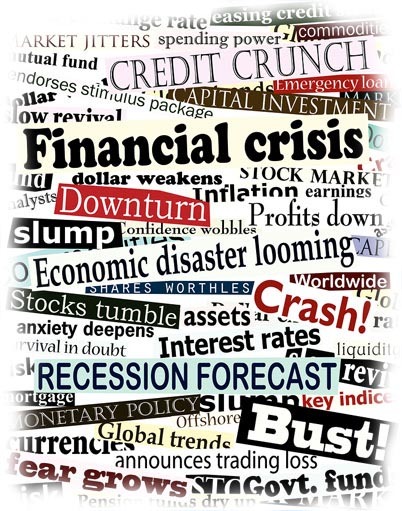 Today, the UK is faces the result of the economic crisis and its economic situation is very bad since few months. An austerity policy is currently working because the UK has the worst budget deficit in the world and the BIP has decreased of 5%. Inflation is present in the UK for more than a year and it is a developped country where inflation is the highest. However, the economic crisis is currently not as popular as events that took place in Japan or in Libya or as the royal wedding. That’s why media don’t care about the economic situation in this busy period. My life in Scoltand: discovery, tourism, parties, classes … But also work ! Indeed, don’t forget that I have to do an intership before coming back to France. 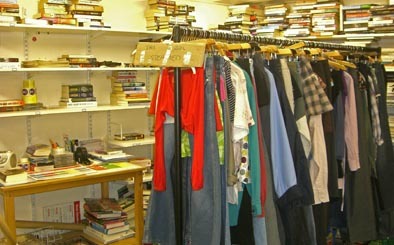 Before I came to Scotland, I knew where I will do my internship: in a charity shop. Indeed, in the UK, these shops that belongs to a charity are very common and we can find them in every road : there are 112 in Edinburgh!! I find the concept very interesting: people give the shop clothes, shoes, bags or everythings they don’t need anymore and which are still in good condition. Then, the shop sell it to customers at a very low price. 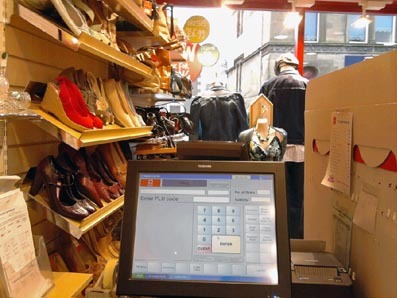 All workers are volounters (exept the manager), what allows charity shops to make a profit to support a good cause. There are a huge number of charity shops and I had to choose one of these to work as a volounter. -First, I wanted to work not far from my flat. -Then, I wanted to work in a famous charity shop that was known to be reliable. -Then, I wanted to work in a charity shop that defends a good and usefull cause. -Finally, I wanted to work in a good team with a good atmosphere. The last week of February, I started looking for the perfect shop ! I went to several charity shops from differents charity organisations to see what the shop looks like, what they sell, what kind of customers are buying, and what is the atmosphere. 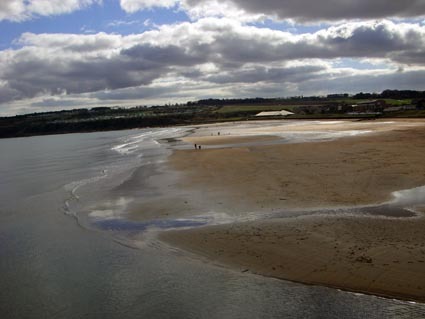 After one or two hours, I didn’t found the perfect one and decided to go to Portobello, Edinburgh’s seaside where I often go to swim (not on the sea!). I enter to the British Heart Foundation charity shop and then… ask if it were possible to speak to the manager. The woman was happy to meet a new motivated volounter ! I started at the beginning of March and will stay until the end of May. 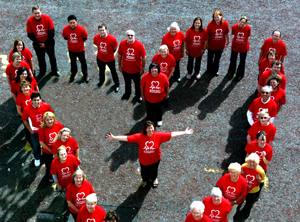 Today, heart disease is the UK’s single biggest killer. This is the beginning of the story of this charity. Indeed, it was founded in 1961 by a group of medical professionals and it’s today the nation’s heart charity which fights everyday against disease of the heart and circulation. In 2010 they invested 85.7£ in meeting their strategic objectives thanks in majority to shops. I will no longer write about it and I will tell you later in another article what I do for the charity. 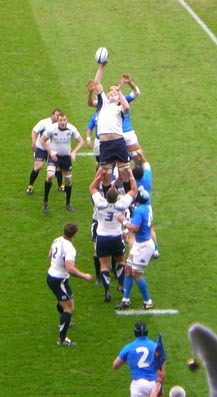 5 April 2011, 1.00pm. 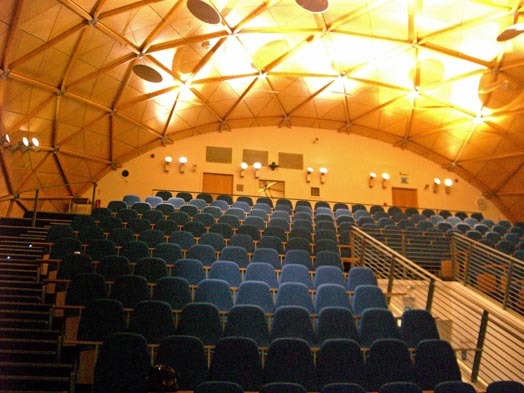 After three months at Napier University of Edinburgh, it is time to say goodbye lectures and tutorials. Back on my experience as a Scottish student. As I explained in one of my first articles, choosing courses in January was easy, but you still don’t know what I studied. At the beginning, I chose 3 courses: Entrepreneurship, Marketing communications and tools and Scottish culture and society. However, after one lecture in Entrepreneurship, I understood that it wasn’t for me: both the teacher and the content of the lecture didn’t interested me. Thanks to an efficient administration, I changed the course and chose another one: The global tourism industry. What a good choice!! As you can see, the hard scottish life consists of 6 hours per week at the University !! Tutorials are always in small groups, aroud 20 and consist of doing exercises and cases. Lectures are in bigger groups, around 40 and consist of sitting and hearing the teacher, without doing anything (because teachers often tell exactly the same things with the same words as in the powerpoint!). Let me explain in details every course. For me, it was the most interesting ! I liked this course because I have always been attracted my the tourism industry. For this course, I had two teacher, a man and a woman. The man was very interesting and interested by its subject. I have learned a lot and it motivated me to work in tourism, as I wanted few years ago ! - One final exam but unfortunately, I can’t tell you what I will have to do ! I think it was the least interesting course I had! During lectures, it was so difficult to be captivated more than 10 minutes… Indeed, the teacher wasn’t motivated and she just read the powerpoint! Added to that, I think I didn’t learn anything because it was more global than in France, at ESDES. Concerning the assessment, we had to work in a group of 5 and to do a report and a presentation about the launching of a product. According to the teacher, it was the work of one semester but I think that it wasn’t so long and so hard as she said. With my group we chose the lauch of a new cider Stella Artois, it was the best subject! I was quite interesting to work about it. This course is only for Erasmus students. Indeed, lectures were about Scotland and its history, culture, language, education, laws, health system… But the best wasn’t it! 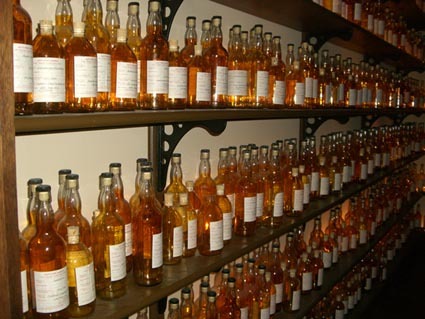 It was the three visits we made: the Edinburgh castle, the village Culross in Fife and the tour in Dunkeld and the visit of a famous distillery. It was a great opportunity to discover the country and to learn a lot about it. I enjoyed this course! However, we had to work because we had to do a poster presentation and an essay. I did the poster about William Wallace and Braveheard and a wrote an essay about the differences in key institutions between Scotland and the rest of the UK. Although we had few hours at the university, teachers were waiting for a good work. Napier University is one of the best business school of Scotland and students were mostly very serious, what differs from France! For every report or essay, we NEEDED to go to the library to take some books and articles to have good references. It was very important because it was absolutely not possible to work only with the Internet. At the beginning, I though that it was just the dream of the every teacher, but when I went to the library, I understood that I wasn’t a joke! But I think that it is a good way to work more seriously instead of taking every ideas on the Web. Finally, the last thing I want to say about the University is that the notation is quite different for France. Results are in percent and 40% are sufficient. But it’s harder than in France to have a very good mark. Every teacher told us that if we had more than 60%, it was a very good mark. What’s better than a short trip on a sunny Sunday, after two days of lectures and four days of work ?! 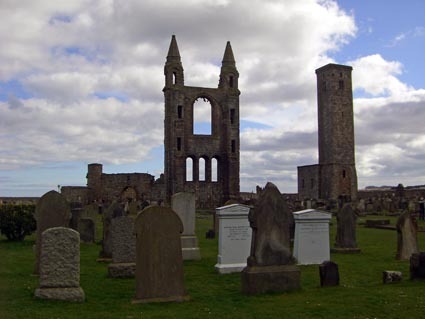 With three friends, we decided to buy tickets to go to St Andrews, a tourist city thanks to its prestigious and famous golf courses, monuments, and beautiful beaches. After two hours with Citylink, the Scotland’s leading provider of express coach services, we arrived in the sunny city. As I said, St Andrews is known for its golf, which is old and famous. 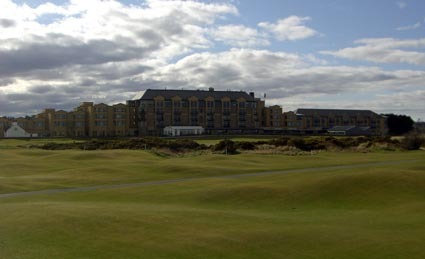 The prestigious Open Championship, the oldest of the four major championships of golf, takes place here. 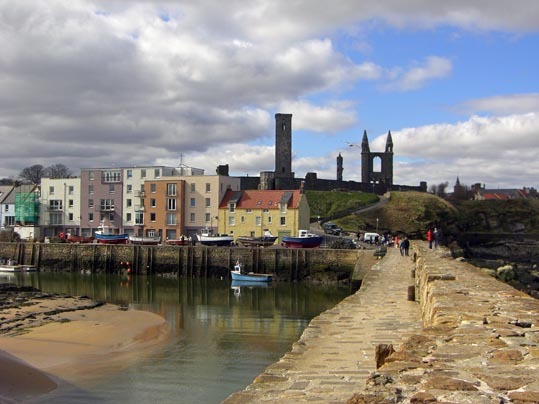 The university of St Andrews is another reason that makes the city a tourist center. Indeed, created in 1410, it’s the third oldest in the English-speaking world after Oxford and Cambridge and it’s the most renowned university in Scotland ! As a matter of interest, Prince William of Wales has studied history of art in this university. 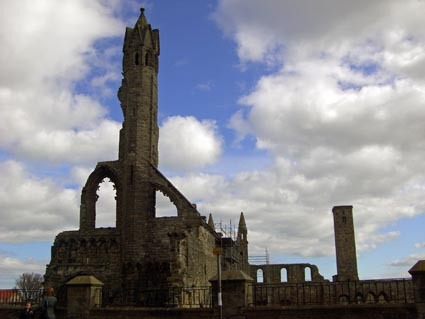 Added to that, two monuments are famous in St Andrews: the cathedral and the castle, which are today ruins. 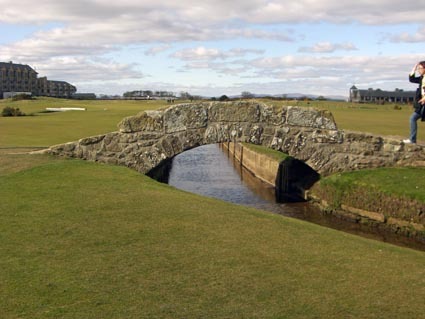 The famous bridge of St Andrews, a golf emblem. 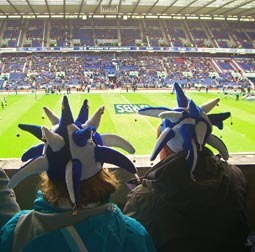 Yesterday was an historic day for Scotland: they won their first match in the 6 Nations !! 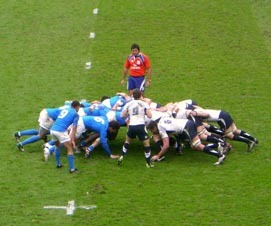 As a national sport in Scotland, I decided to buy tickets (with a rugby fan) for the match ‘Scotland-Italy’ at Murrayfield (Edinburgh). I came to the stadium one hour in advance to see players training and to take some photos of the place. Lucky day in Edinburgh: no rain ! The stadium wasn’t filled but the atmosphere was awesome ! 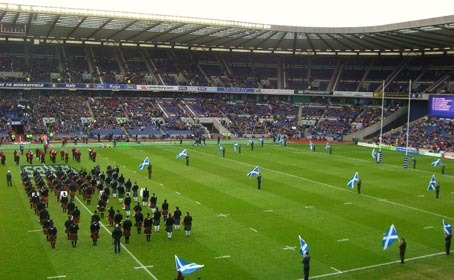 Before the begining of the match, a scottish band and the army went on the field during the national hyms of both Italy and Scotland. 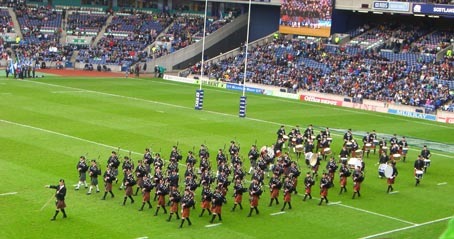 It’s quite amazing to see people with kilts playing bagpipes before a match! And… THE WIN OF SCOTLAND: 21-8 ! What a match ! 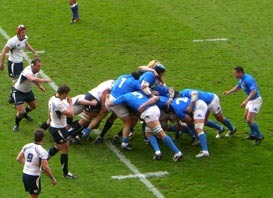 I really enjoyed it and it was a great opportunity to see it with a rugby player because he explained me every rule during the game. 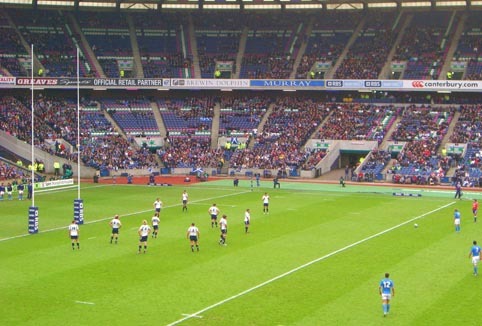 It’s too bad that it was the last match in Murrayfield for the 6 Nations. Now, let’s enjoy some photos !